Eric Halverson, Jr. is a lifelong resident of the greater New Orleans area and worked his way through college investigating marine and liability cases. He also became Vice President and Co-owner of a local adjusting service, overseeing a staff of adjusters and handling more serious maritime claims for domestic and offshore companies as well as general liability and medical malpractice claims. Upon completing Law school in 1984, Mr. Halverson began transitioning from claims investigation and supervision to legal practice, eventually establishing his current practice in 1988 devoting his time exclusively to litigation of General Maritime and Casualty cases with emphasis in the fields of Jones Act, Collision, Hull & P & I claims, Maritime General Liability, Longshore & Harbor Workers Claims, State Workers Compensation, General & Premises Liability, Construction Law, Coverage Issues, Errors and Omissions, Medical Malpractice, Product Liability, Auto and Truck Liability. 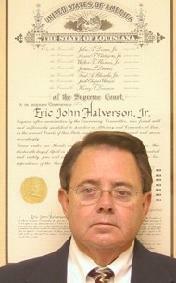 Mr. Halverson has been practicing law from his present location for over 20 years and has litigated numerous cases in the State and Federal District and Appellate Courts of Louisiana, the Louisiana Supreme Court, the Louisiana Department of Labor and the US Department of Labor - Office of Longshore and Harbor Workers.